The problems with Greece continue to remain headline news and to date the markets remain extremely nervous and will continue to be so until the details of any bail out package are confirmed. At present there appears to be a standoff between Greece and Germany/France with neither prepared to confirm or deny any details until the other party also put their cards on the table. The German view at present is that the Greeks are being less than transparent and at the moment are failing to take the necessary and painful steps that are required to cut the current appalling deficit. One small crumb of comfort for Greece is that the cost of insuring their debt has in recent days fallen slightly. The currency speculators are continuing to bet against the euro adding further short positions in increasingly large volume and, as a result, we could see a collapse in the euro vs dollar at some point in the next few days. The trigger could well be any statement from the ECB which is generally considered to be a very conservative and orthodox organisation and the markets will be paying very close attention to both the content and tone of their proposals. From a technical perspective yesterday’s price action merely reflected the current global picture with price action confined to a narrow trading range closing the day with a narrow spread down candle with wicks to both the top and bottom, a doji candle clearing indicative of indecision. Once again the 9 day moving average provided the barrier to any attempt to rise, and this trading pattern is being replicated in this morning’s London session. 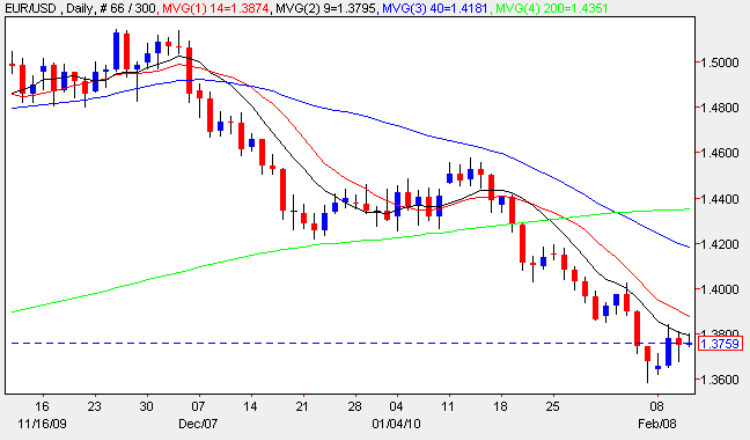 Should we see a sharp move lower then any break below the previous floor at USD1.36 will signal a much deeper move possibly to re-test support in the USD1.3280 region. With the EU economic summit overshadowing the fundamental news expect to see a relatively quiet day for the euro vs dollar until we see the associated statement which is due for release on the conclusion of this meeting. In the meantime any fundamental data is likely to have little impact and even the weekly unemployment claims due later in the US may have a muted effect. Euro vs Dollar News – So Many to Choose from but here are my favourites! Ambrose’s Take on Euro Crisis – A must read! Will German bailout be bearish for Euro?